Posted on 05/12/2018 at 2:45 pm. It’s been a well-known secret for ages: Anyone that wants to know what the future holds in store in terms of innovation in medical care should take a look at the new products and achievements of the suppliers to the medical technology industry. They are providing valuable technological inspiration, react quickly to trends and offer their industrial partners high-tech solutions that are made to measure. This was confirmed once more at COMPAMED in Düsseldorf, the international leading trade fair for the medical technology supplier sector. COMPAMED, which is always held alongside the world’s biggest medical trade fair MEDICA, was on top form once more this year (run time for 2018: 12 – 15 November). Halls 8a and 8b of the Düsseldorf trade fair centre were completely full, holding 783 exhibitors from 40 countries (making this COMPAMED more international than ever before). Once more, COMPAMED saw 20,000 professional visitors, which put the cherry on the cake. Around the world, the number of people with high blood pressure is increasing further – one in every three people in the world now has high blood pressure. Due to this, millions have cardiovascular disease, which is among the most common causes of death. As high blood pressure is often symptomless, having blood pressure taken regularly is very useful in diagnosing it. Considering this, the CiS Forschungsinstitut für Mikrosensorik GmbH (CiS Research Institute for Microsensors) has developed a non-invasive method for monitoring blood pressure via the ear. This is based on an optical sensor which was created based on methods which analyse pulse waves. Here, visible or infrared light is emitted into the skin and the reflected component is measured. The levels of intensity recorded enable conclusions to be drawn on blood pressure fluctuations in the skin. This compact sensor system is worn inside the ear (in the auricle) and is adapted to the individual. “Now, we can determine blood pressure at specific times and also provide continuous monitoring of fluctuations in blood pressure” remarked Andreas Albrecht, Project Engineer at CiS, with delight. The data on the blood pressure trend are determined via a patented mathematical algorithm. The researchers from Ilmenau are now simply seeking an entrepreneur who will bring their development onto the market. The potential here is huge, as this new method is far more precise than the classic blood pressure cuff. The Fraunhofer Institute for Electronic Nano Systems (ENAS) is also following the trend for miniaturising medical technology. Endoscopes can be fitted with a special microsystem (an array of ultrasonic transducers). With this support, it is possible to stimulate diseased tissue both locally and selectively, in order to supply medication in a better and more targeted manner. This means that treatments with a large range of potential side effects can be done away with. Currently, this conservative endoscopic procedure is being used in the fight against colon and prostate cancer or to treat myoma. ENAS is working on minimally invasive, miniaturised, capacitive ultrasonic transducers for microendoscopy in this sector. “We want to use our method, which functions using a similar method to hyperthermic therapy for specific types of cancer, to improve the therapeutic applications”, said Andreas Morschhauser, of the Department for Multi-Device Integration at ENAS. The objective here is to eliminate tumours with therapy that is less harsh on the patient, through membrane stimulation and increasing the metabolism of the pathological cells. Trends such as patient-friendly point-of-care applications, improving patient compliance, complex administration of medication and wearable device design mean that smart medical devices need to be developed. Sensirion, one of the leading manufacturers of digital microsensors and systems, presented new flow sensors in the LD20 series for high-volume applications in medical technology at COMPAMED 2018, among other elements, to support these trends. “This sensor enables bidirectional measurement of flow rates of a few millilitres per hour up to 1000 ml/h and can simultaneously detect typical issues such as occlusion, free flow or air bubbles with unprecedented speed and sensitivity”, commented Barbara Thurnherr, who is Project Leader for Marketing and Communication at Sensirion. Thanks to Sensirion’s CMOSens technology, the LD20 is sensitive enough to detect even the slightest change in the flow rate. This means that the sensor can even detect the oscillating back pressure of the patient’s venous pulse; in other words, it can feel the patient’s heartbeat. Detecting the heartbeat on the flow rate is a direct indication that there is an intact connection between the infusion cannula and the vein of the patient. The LD20 series enables medication administration to be measured precisely and in real time, which means that therapies elicit better treatment results and safety, effectiveness and reliability are all improved, which benefits patients and medical staff alike. Active implants such as pacemakers, neurostimulators or medicine pumps are increasing in number. This means that requirements for them to be MRI compatible are also becoming more prevalent. The German Federal Ministry of Education and Research (BMBF) is supporting the MRI-compatible implant joint project (MR-Implant) with almost two million Euro. This project focuses on researching and developing an electronic neural implant system. The coordinator of the joint project is CorTec, a company which has already presented electrodes and its Brain Interchange technology at COMPAMED in the past. “Ultimately, the end goal is a neural implant system which is safe and has expanded functions, which will enable MRI diagnosis to be carried out on patients wearing the implant for the first time”, stated Dr. Fabian Kohler, Head of Reliability Engineering at CorTec. The company’s system primarily targets conditions such as Parkinson’s, epilepsy and strokes. The implant systems will exchange data at high speeds, record neural activity and also provide stimuli. Simultaneously, they must enable the patient to undergo MRI investigation without causing any issues. “Today, we are still seeing problems caused by the heating effects, currents and artifacts: we want to change this”, said Kohler. The MRI-compatible implant project has been underway since March 2018 and will run for three years. In addition to microsystems and sensors which come with a wide variety of shapes and characteristics, sophisticated packaging solutions are always a prime point of interest at COMPAMED. Inpac Medizintechnik is a one-stop service provider for cleaning, assembly, packaging and sterilisation of medical products. “Our mission is to create tailor-made solutions for our customers while working under our motto: ‘All from one source’”, said Dr. Ralph Hermann, the CEO of inpac. High-quality products such as bone screws, stents and implants require suitable packaging. Inpac works across 1,700 square metres of clean room space which complies with ISO Class 7. In addition, each packaged product is examined under an illuminated magnifier. Ten percent of the staff are engineers and scientists, who are primarily focused on the validation process. The simulation of the entire process is becoming more and more important. Here, transport, mechanical durability and ageing. Additional requirements also result from a new definition of cleanliness which expands the scope of the previous definition considerably, including bacteria, particles, endotoxins (by-products from bacteria), cytotoxic substances and chemicals. Inpac is ready to take on these challenges. E&E Kabeltechnik is also taking on special tasks for the medical technology industry: These specialists from Westphalia came up with a three-pole, biocompatible cable for the Plasmapatch wound dressing from Coldplasma Tech, a start-up. This cable is not only plasma and autoclave compatible, it is also very flexible. “We can therefore ensure that the connection between the plasma source and application is never kinked and remains break-proof,” explained Ole Tiedt, who works in Sales and Marketing at E&E. The cold plasma destroys bacteria, other pathogens and fungi, stimulates the body’s own capacity to heal and does not induce any side effects or antimicrobial resistance. The luminous blue gas is a ray of hope for patients with bedsores. This development has recently been awarded the German Prize for Innovation in the Start-Up category. The E&E cable specialists also played a significant role here. The adhesive specialist Henkel attended COMPAMED for the first time. This Düsseldorf-based company showcased a new acrylic ester adhesive which offers many advantages for design and manufacturing. Two of these products were specially designed for flexible applications with thermoplastic elastomers (TPE) and thermoplastic polyurethane (TPU). These are substrates which are increasingly requested in specifications in medical technology. As a low-viscosity, LED-curing and highly flexible adhesive with a non-stick surface once it has set, high ductility and excellent bond strength, for polycarbonates, PMMA and other rigid plastics used in this market. “Curing via LED saves costs as the lamps can be switched on and off. In addition, the narrow range of light wavelengths without infrared emissions enable the manufacturers to reduce their energy consumption and minimise the heat produced, which needs to be dissipated. This is particularly important for clean room applications”, stated Andrés Bultó, Business Development and Key Account Manager for Medical at Henkel. Examples of uses for the new adhesives include connecting tubing and infusion sets, catheters, ventilator systems, caps for cannulas and fluid collection devices. The new adhesives are certified for biocompatibility and have proved that they can withstand the current established sterilising processes. Schneeberger is a leading provider of linear technology. For years, the miniature guideway system MINIRAIL, available in a range of widths and carriages, has also proved its worth in transporting and positioning samples and other elements in medical technology, in laboratories and in clean rooms. “MINIRAIL are miniature guideways which are perfectly suited to reliably providing the highest level of precision in the smallest spaces,” stated Andrè Butrin, the Regional Sales Manager at Schneeberger. The carriages can accelerate at up to 300 metres per second² at a maximum speed of five metres per second. As a new development, Schneeberger showcased its first miniature guideway with an integrated optical distance measuring system, called MINISCALE. This means that all expenditure for additional separate distance measurement systems are dispensed with, and less components are required which makes construction far easier. This miniature measurement system is particularly well-suited to use in small installation spaces, as is often the case for optical devices within medical technology. Helmut Hund GmbH is also focusing on sample carriers, even though the circumstances are slightly different. At COMPAMED, they showcased the Lateral Flow Tester, LFT100, a mobile compact device for fast diagnostics on blood and other bodily fluids. The star feature of this hand-held device is that it can measure sample carriers from all popular manufacturers. “Our system therefore ends incompatibility with the numerous shapes and sizes of test strips which often make medical diagnostics difficult, time-consuming and expensive in the prevalent forms of lateral flow tests,” said Peter Nadler, Sales and Marketing Manager for Instruments at Hund. Test strips with single or multiple samples of up to 90 x 60 millimetres can also be analysed by this innovative device without any issues. Thanks to a mains supply and battery, the LTF100 can be used both on the go and fixed in one place. The sample is taken in, measured and analysed within seconds. This occurs via the highly precise optics, without any mechanics, inside the device. “Enzyme-linked Immunosorbent Assay”, this mouthful of a phrase represents a medical achievement that saves lives every day: the ELISA test. With this antibody-based procedure, diagnostic companies can detect life-threatening illnesses such as the HI virus. The ELISA test kits consist of (auxiliary) reagents and microwell plates. Optima Life Science already has a machine solution at hand for coating microwell plates. At COMPAMED 2018, this specialist machine builder has now also developed a solution for filling reagents. The new filling system, called “OPTIMA ImmuFill” automates a process, namely filling the (auxiliary) reagents for ELISA test kits, which many diagnostic companies are still doing manually or using very simple device solutions. “We’re filling a gap in the market with this solution,” said Wolfgang Pyrags, the Sales Director for the company, who is very pleased with the solution. Microsystems and sensors, active implants, special adhesives, linear technology, packaging and high-tech machine construction and even 3D printing: COMPAMED 2018 offered full halls, but more importantly, it offered a wide spectrum of innovative solutions for medical technology. 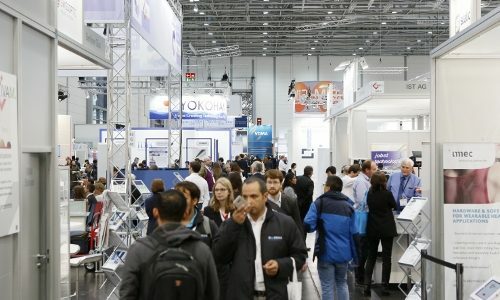 In addition to the exhibition area, two established forums presented the trends in the supplier field of medical technology: At the COMPAMED SUPPLIERS’ FORUM (sponsored by the DeviceMed trade publication), the main focal points for this year were: Additive manufacturing, cybersecurity, regulatory affairs and wearables. The COMPAMED HIGH-TECH FORUM presented by the IVAM Association for Microtechnology places key focus on microsystem technology, nanotechnology and production technology and process control.